Love your heart – eat lentils: Numerous studies confirm that eating high fiber foods, such as lentils, helps prevent heart disease. Compared to other types of dried beans, lentils are relatively quick and easy to prepare. They readily absorb a variety of wonderful flavors from other foods and seasonings, are high in nutritional value and are available throughout the year. In addition to providing slow burning complex carbohydrates, lentils can increase your energy by replenishing your iron stores. Particularly for menstruating women, who are more at risk for iron deficiency, boosting iron stores with lentils is a good idea—especially because, unlike red meat, another source of iron, lentils are not rich in fat and calories. Iron is an integral component of hemoglobin, which transports oxygen from the lungs to all body cells, and is also part of key enzyme systems for energy production and metabolism. And remember: If you’re pregnant or lactating, your needs for iron increase. Growing children and adolescents also have increased needs for iron. 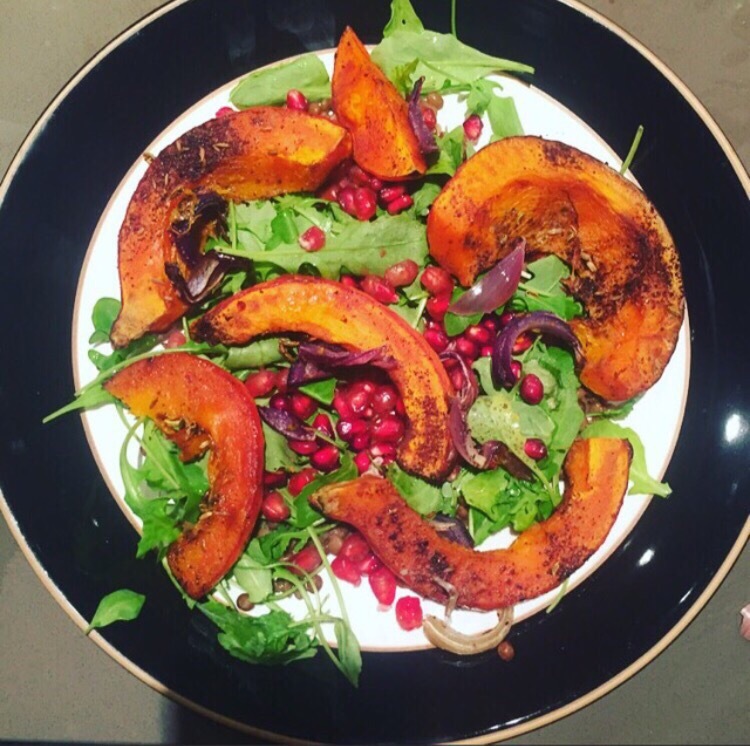 This delicious Vegetarian salad recipe is the perfect autumn warmer . Squash and pomegranates supercharge this recipe with antioxidants and vitamin C which counteract the damaging of free radicals. Vitamin C boosts our immune system, fights inflammation and promotes the production of collagen which keeps our skin elastic and radiant. -1 heat your oven to 200 degC/ fan gas6. Halve the squash and scoop out the seeds. Slice into wedges around 3cm thick. Put in a bowl. -measure out 1tsp each of the sumac, fennel and cumin seeds. Add to the squash with a pinch of chilli flakes and 1tbsp oil. Season. Toss the squash to coat in the oil.Spread out on baking tray. Roast for 20 minutes. -while the squash roasts. peel the onion into thick wedges. -after 20 minutes in the oven, take the squash out and scatter the onion on the tray around the wedges. Slide back into the oven and roast for 30 minutes till the squash and onion are tender and a little charred. – Halve the pomegranate around its middle. hold one half in your hand, cut-side down. whack with a wooden spoon over a bowl. The seeds should tumble out. Repeat with the other half to get all the seeds out. Drain the lentils. Rinse and tip into a pan with a few few spoonfuls of water. gently heat for 2-3 minutes till warmed through. Drain well. – add the lentils and rocket to the pomegranate seeds. Season well. Toss to mix Heap on warmed plates. Toss with the roast squash. Serve straight away.